American College of Physicians has issued the guideline on Oral pharmacologic treatment of type 2 diabetes mellitus, A clinical practice guideline.This guideline has been developed by American College of Physicians (ACP) to present the evidence and provide clinical recommendations on oral pharmacologic treatment of type 2 diabetes in adults. This is an update to the 2012 ACP guideline on the same topicand it has been endorsed by the American Academy of Family Physicians. Definitions for the overall quality of evidence (high, moderate, low, or insufficient evidence to determine net benefits or risks) and the strength of the recommendations (strong, weak) are provided at the end of the “Major Recommendations” field. Metformin is effective in reducing glycemic levels, is associated with weight loss and fewer hypoglycemic episodes, and is cheaper than most other pharmacologic agents. Although the evidence was considered low quality, metformin may have an advantage over sulfonylurea monotherapy in terms of cardiovascular mortality. Therefore, unless contraindicated, metformin is the drug of choice for patients with type 2 diabetes, in addition to lifestyle modification. Any condition that might lead to lactic acidosis. However, the FDA recently concluded that metformin is safe in patients with mild kidney impairment and in some patients with moderate kidney impairment (but is contraindicated in those with an estimated glomerular filtration rate <30 mL/min/1.73 m2). Recommendation 2: ACP recommends that clinicians consider adding a sulfonylurea, a thiazolidinedione, a sodium–glucose cotransporter-2 (SGLT-2) inhibitor, or a dipeptidyl peptidase-4 (DPP-4) inhibitor to metformin to improve glycemic control when a second oral therapy is considered. (Grade: weak recommendation; moderate-quality evidence.) ACP recommends that clinicians and patients select among medications after discussing benefits, adverse effects, and costs. Combination therapies with metformin were more effective than metformin monotherapy in reducing hemoglobin A1c (HbA1c) levels, weight, and blood pressure in patients with type 2 diabetes. This recommendation is graded as weak because of the fine balance between benefits and harms for the various drug combinations. See Table 2 in the original guideline document for a summary of the comparative benefits and harms of metformin combination therapies as well as the adverse effects and cost of each medication. The evidence review did not include therapies combining more than 2 agents. Combination therapies also were associated with an increased risk for adverse effects compared with monotherapy. Sulfonylureas have been used for many years and are the least expensive oral agent to add to metformin. However, sulfonylureas, both alone and combined with other agents, are associated with an increased risk for mild, moderate, or severe hypoglycemia as well as weight gain. The evidence review did not address medication switching for patients currently taking sulfonylureas. Regarding patients whose glycemic levels are adequately controlled and who do not have adverse effects with sulfonylureas, keeping them on this drug may be reasonable. The SGLT-2 inhibitors are favored over sulfonylureas as an add-on to metformin therapy in terms of cardiovascular mortality, HbA1c, weight, systolic blood pressure, and heart rate and are favored over DPP-4 inhibitors as an add-on to metformin therapy in terms of weight and systolic blood pressure. As an add-on to metformin therapy, DPP-4 inhibitors are favored over sulfonylureas for long-term all-cause mortality, long-term cardiovascular mortality, and cardiovascular morbidity; over pioglitazone for short-term cardiovascular morbidity; and over sulfonylureas or thiazolidinediones for weight. Each class of drugs is associated with adverse effects, which are summarized in the original guideline document. The FDA warned that the DPP-4 inhibitors saxagliptin and alogliptin may increase the risk for heart failure, especially in patients who already have heart or kidney disease. The SGLT-2 inhibitors are associated with an increased risk for genital mycotic infections. 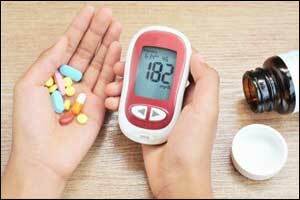 Sulfonylureas are associated with an increased risk for hypoglycemia. Although this guideline addresses only oral pharmacologic therapy, patients with persistent hyperglycemia despite oral agents and lifestyle interventions may need insulin therapy.